Radha Madhav Dham’s architectural beauty is designed to capture the heart of devotees and create devotional excitement so it can bring Radha Krishna closer into their hearts. The Shree Raseshwari Radha Rani Temple and ashram complex of Radha Madhav Dham. 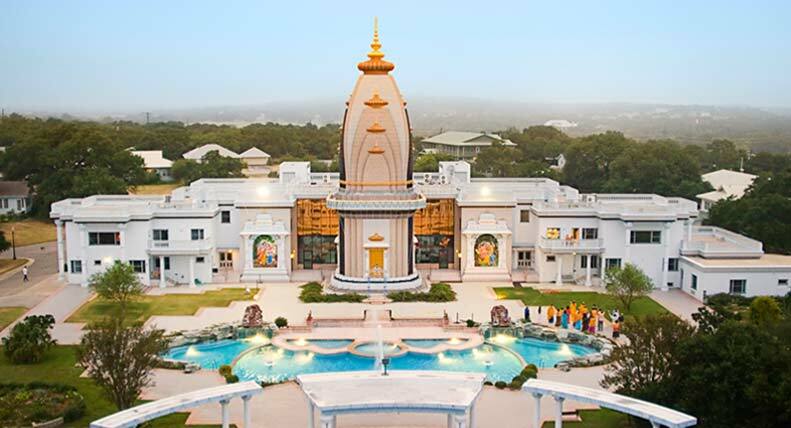 Located on over 200 acres in the famous Hill Country of Austin, Texas, the Shree Raseshwari Radha Rani Temple at Radha Madhav Dham (RMD) is the largest Hindu Temple complex in North America. The 35,000 square foot, 7 level, main Temple represents an unparalleled example of the ancient Vedic architecture of India, featuring elaborate and traditional hand-sculpted motifs throughout, beginning with the spectacular 90 ft. shikhar (main tower) that greets visitors, the pillars of the front verandah and the richly accented interior space of the main prayer hall. Beautiful gardens, outdoor shrines, meditative walking paths, two ponds and a local stream renamed after the holy river, Yamuna, constitute a devotional re-creation of the holy district of Braj, India. This awe inspiring temple architecture has recently shared center stage with famous cathedrals such as the St. Patrick’s cathedral and cathedral of Saint John the Divine in New York City and Salt Lake Mormon Temple – having being featured, along with them, as one of the 13 most fascinating “Houses of Worship in America” by Newsmax. Notably, Radha Madhav Dham was the only Hindu temple on this list. Click here to read news article by Newsmax published November 8, 2013. The architecture is an excellent blend of North Indian, South Indian, ancient and modern styles of architecture. There are 84 columns and five levels in the building with a covered area of 35,000 sq. feet. The floral patterns on the entrance doors, the entrance of the shrine and the style of columns create a feeling of grandeur like you were walking into a Hindu palace of ancient times. A very unique and important feature of the Temple satsang hall is that it depicts the essence of the entire Bhartiya philosophy. The most important themes of the essential scriptures are described in a continuous panel on the sides of the hall highlighted by beautiful and inspiring devotional pictures of Radha and Krishna all displayed under a grand and realistic depiction of the sky. Shree Raseshwari Radha Rani Temple is one of the largest Hindu temples in the United States.